The National Snaffle Bit Association is pleased to announce the 2nd Annual Coaches Summit to be held in Dallas, Texas March 25-27, 2019. Instruction will be classroom and on-site based. Bridlewood Equestrian Center, home of Stable Strides, LLC, will host the interactive sessions at their facility in Flower Mound, TX. The program is funded as a special project of the NSBA Foundation. 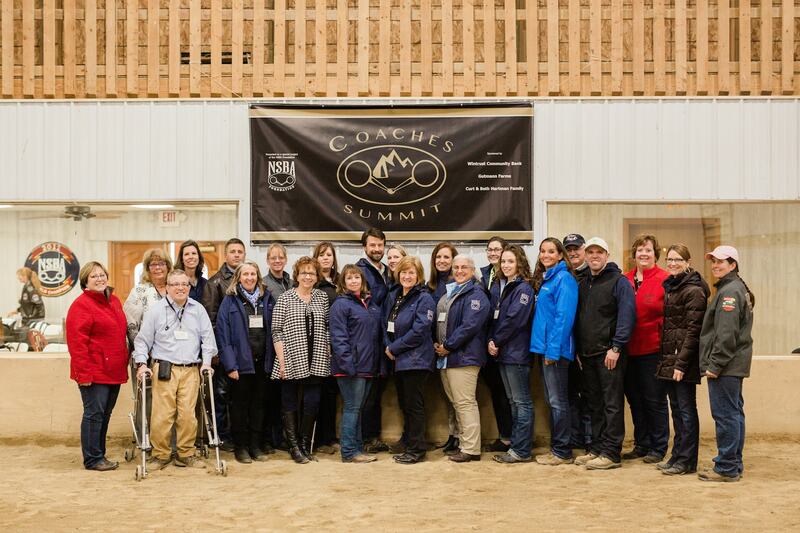 The 3- day workshop is designed for equine industry professionals, therapeutic riding center coaches, staff, volunteers or any interested stakeholder to explore opportunities for engagement and expansion of current or new riding programs. It also includes instruction about NSBA competitive events for the inclusion of Equestrians with Disabilities or Veterans using horses as a form of therapeutic riding. Complete details and agenda of the 3 day event will be released in early 2019. Financial stipends are available to interested applicants to offset travel, lodging and meals at the conference. As a special project of the NSBA Foundation, the work shop is funded in part by Gutmann Farms -Texas and the Curt & Beth Hartman Family. The Heroes on Horses and Equestrians with Disabilities are two of five programs administered by the National Snaffle Bit Foundation, which also include the Animal Welfare Fund, the Trainer Crisis Fund, and the Education Fund. NSBA’s Equestrians with Disabilities and Heroes on Horses provides a competitive platform for independent and supported riders to participate in and compliment the work of PATH Intl. The programs are open to any age rider in Western and English disciplines. PATH Intl. Certified Professionals can receive continuing education credits for attending the Coaches Summit as outlined in their certification requirements. Operating under a separate board of directors, the NSBA Foundation serves as the fiduciary arm of the National Snaffle Bit Association and provides funding to support the efforts of the Association through programming specific to the equine industry and the NSBA membership. The NSBA Foundation is a registered 501(c)(3) organization.